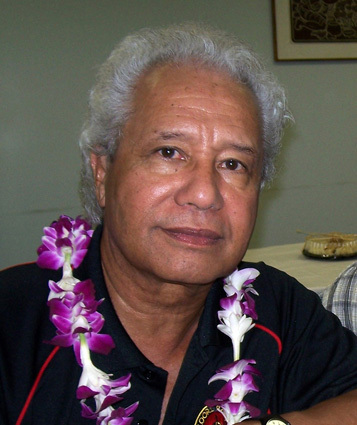 Forty years on from the publication of his groundbreaking novel Sons for the Return Home, world renowned writer and teacher Maualaivao Albert Wendt is being honoured for his enormous contribution to Pacific and New Zealand Literature. Students under 18 years of age are being offered free entry to this significant event, which takes place at the Auckland Writers & Readers Festival. 5.30–6.45pm on Sunday 19 May. Students over 18 are offered a special ticket price of $12.50. - an operatic aria from emerging Pacific singing star Isabella Moore. Maualaivao Albert himself will talk about his life and work with poet Robert Sullivan (Ngapuhi/Irish), Director of the Manukau Institute of Technology Creative Writing programme. In 1973 an emerging writer by the name of Albert Wendt delivered his first novel. Sons For The Return Home was groundbreaking, exploring love, freedom and racism in Aotearoa New Zealand. It was made into a film and became a secondary school text. Forty years on, in the largest Polynesian city in the world, Maualaivao Albert Wendt CNZM, Emeritus Professor of English at The University of Auckland, continues to break new ground as a novelist, poet, playwright, short story writer and artist. In 2012 alone he published the poetry collection From A Manoa Garden to Ponsonby and the short story collection Ancestry. Wendt’s contribution to the literary landscape is immense; his body of work an inspiration to generations of readers; his contribution to a Pacific literature unmatched. To celebrate his accomplishments, this session will bring the sounds of the Pacific to the stage: live Samoan music with sellout The Factory cast singing one of the hits from the show and emerging opera star Isabella Moore performing an aria ; excerpts from Wendt’s writing read by Bill Manhire, Selina Tusitala Marsh and Witimaera; and Wendt himself, who will distil his life and writing in conversation with Robert Sullivan. Note: Under 18s are eligible for a free ticket to this event, to be booked through THE EDGE ticketing service.